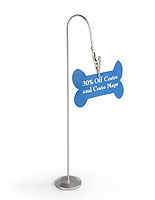 This table number stand provides a means of advertising specials or promotions. 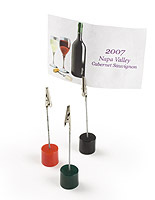 The place card holder, such as a photo clip, is ideal for restaurants or bars advertising daily or weekly specials. To use this table number stand simply clip signage into the sturdy alligator clip to increase sales or reduce extra inventory. Place this picture clip on a desktop or in a cubicle to hold important reminders or messages. This table number stand, a highly effective POP display can also be used in retail or public locations to announce sales, clearances, or events. The small footprint enables users to place this unit on a tabletop or counter without taking up valuable display space. Each table number stand features a weighted base to prevent tipping. 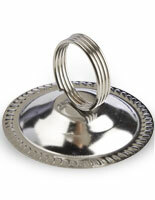 The silver coloring on this place card holder is neutral, and blends with most any type of environment. A highly versatile piece, this table number stand accents any environment. The tabletop unit is a portable display holder but could easily be secured to a variety of surfaces with glue dots or superglue. 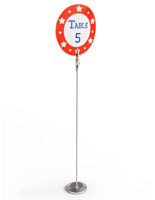 Each table number stand can hold advertisements, specials, photos, or signs up to ½" thick. Signage can also be displayed horizontally or vertically within this versatile clip holder. 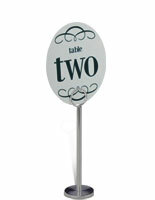 This table number stand, including its base, extension, and clip stands 4-1/2" high and weighs only ounces. This POP display is the perfect solution for in-store advertising and promotions. 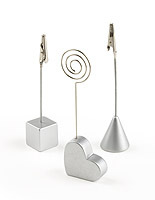 This table number stand is sold in quantities of forty eight or more!